Something that we have all tried to do before but almost failed to change someone else's mind to our way of thinking and this is the biggest problem because a lot of relationships actually get ruined when we try to convince someone to our way of thinking. 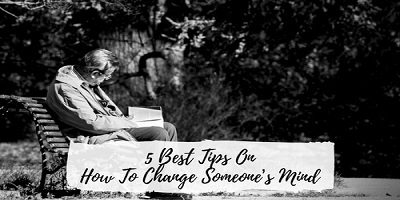 So, here are 5 best tips on how to change someone’s mind. It should be a conversation where you show your opinions, the facts that you have and the data that you've collected. That actually doesn't hinder or hurt the other person's opinions. You might think that if you just proved your point logically, the common sense will tell the other person that you are right. But the problem is that emotions play a much larger impact on our decisions than what our brain logically decides as facts and this is where most of us get confused. Just because you may be right, technically correct and have more supporting data, doesn't mean that the other person is going to think in your way or might not have his ego built in a way that he will accept your thoughts. So, when you're trying to change someone's mind try to keep it as a conversation and not an argument. If you're going to tell someone that” you are wrong”, you're going to give him a strong reason to come back at your argument and just topple all of your other arguments and supporting details. Even if you show him a whole bunch of logical reasons and acceptable data after that you've already said that “you are wrong” at some point. If you really want to change someone's mind, you have to completely avoid looking like you're trying to change their mind, because this could invoke the minds and his strong emotions. If you're going to prove anything, don't let them know that you're going to prove it. Here are the facts, the key is to say that you might be wrong, not that you are wrong. The facts are that you're not saying that you are wrong, you're just saying that you're open to new ideas and this is super important in convincing someone else to your way of thinking. So, this is like the foot in the door technique. Begin by emphasizing and keeping on emphasizing stuff that you agree on when you're starting the conversation, maybe your hobbies that you have something that they're passionate about something that gets them saying yes because the more that you get them to say “Yes” the more likely they are to say ”Yes” in the future. It's like a little psychological trick that a lot of salesmen use to sell their products and services. Also starting on a conversation on something that they're passionate about or something that we both have in common will get to start to like you and maybe even more open up to ideas that you have and it establishes trust among both. Now, this is where most of us go wrong, what we do is we try to talk more to try to convince the other person of their way of thinking. First of all, if you let them talk more, you're going to show that you actually care about their opinions and ideas which will eventually earn their respect. People love when you give them your full attention because people want to express their own opinions to you. So, by listening to them you're going to create a friendly relationship and build trust and in doing so you express your opinions, your fact, and your data and they will have a higher likelihood of paying more attention to you as well. Also if you disagree with something that they're saying, never make the mistake of interrupting them and this is super dangerous because it's basically like you're attacking and they might take it to their ego. This can change the whole argument from who is right into, I am right and you are wrong, no matter what the data says. Also they probably still have a lot more stuff in their head to keep on talking. So, just listen patiently with an open mind, encourage them to talk even more so that when it's your turn to talk, they'll be out of stuff to talk about. If you don't have a lot more faith in an idea that you come up with, then someone else that gave that idea to you. You can put that idea into practice with someone else and it's wiser to make suggestions and let someone else come to the conclusion. When you let someone do the conclusion, they feel and have a sense of pride that it's their idea and you can do this a lot in business, you can do this a lot in your workplace. Giving someone else your data and letting them come to the conclusion lets them feel like it is their idea and they take pride in it. So, these are 05 simple, but best tips will help you win someone to your way of thinking and of course if you do not have enough facts or do not have enough data to convince them then you can do one of two things. Maybe it’s the youths who are the ones, who need to change their thinking?